A young werewolf pup drifted downstream, carried by the river's current. She clutched onto a log for dear life, wounded all over her face, chest and arm. She was lucky, very lucky to have survived the ordeal. Her parent's sacrifice had led her to this point, but it would seem she was going to die anyway. There were sharp rocks jutting out of the water like the jaws of a shark, certainly enough to shred a helpless werewolf to death if she'd helplessly ran into one. So far though, she'd become lucky enough to avoid those. Clara floated downstream for a few days, until the river came to a stop at a wide expanse. The current this far down was not strong enough, and eventually, the log and Clara washed up ashore. She was picked up by a young man, the son of the village chief. Werewolves were dangerous and had mean appetites, everyone knew this for a fact, but it did not stop the man from taking her. He thought it too cruel to just let her die. And if he did not take her in, then she would've either died to blood loss and exhaustion, or became the food of some wild animal. The girl, Clara was old enough to remember her name, but she'd forgotten most of her ordeal growing up. Her journey started in Bolarem. She was in Azuria now. Years passed, and time moved forward, and the young werewolf grew up to be a beautiful young woman. At first, she didn't know she could transform back and forth, but the villagers always knew, she was an odd one, or perhaps one of especial blood. No ordinary werewolf could stay in werewolf form for as long as she did, which could be counted in YEARS before she learned to change back into her human form. The village elder, now chief, trained Clara to be one with the law, and sent her to Azuria's capital to train her and enlist her in the Azuria military. She was going to start at the foot of ranks, as a grunt, a private. She's a highborn werewolf and she makes that known. This, she exhibits through her ability to maintain werewolf form for extended periods of time without exhausting herself or going berserk. She's forceful, and sticks to her virtues. Clara is stubborn and will defend her claims no matter what. She's a protector, and as the village elder had saved her from demise, she believes the good humans are worth protecting. To do this, Clara joined Azuria military and learned an assortment of skills in various weaponry to make her life and job easier to accomplish. Despite being highborn, she has no qualms with serving as a lowly grunt. As a werewolf, Clara is capable of changing from a human to a werewolf. As a highborn, she has the augmented ability of not requiring a fullmoon to transform, which further allows her to stay in werewolf form for extended periods of time. Although she has yet to learn, she is also capable of transforming into a giant wolf, 7 foot tall. A human being who lives after being bitten by a werewolf (in werewolf form) is afflicted with the curse of the werewolf. This ability is possessed by Clara, as her kin. Even in her human form, Clara's sharp senses is akin to a dog's, allowing her to distinguish individual smells. This makes her an excellent detective and has solved many mysteries back in her village. It also aids Clara in hunting. In her normal human form, her strength is similar to any other human being, but when she changes form, she gains the strength of four or five men in her arms. Even in human form, Clara possesses enhanced reflexes, complimented by her sharpened senses. She can detect the swiftest of sounds in battle, allowing her to effectively dodge attacks, even when thrown from her blind spot. This ability is heightened in her werewolf form. Minor cuts heal almost instantly when she's in human form, and large gashes heal in no time in her werewolf form. This of course uses up a lot of her calories, and as such, after a severe beat down, she needs a lot of food to keep up with her regenerative capabilities. If she's not had anything to eat for a long time, her regeneration stops working and Clara shrivels up until she is a bag of skin and bones. Clara is an excellent swordsman, which is complimented by the fact that she can wield and fight with swords even in her human form. Her senses, being sharper than humans, naturally compliment with her reaction speed to provide for an ability with the sword that can't be rivaled normally. One of her most sought after skills is her ability to track down convicts and criminals and putting them behind bars. She might be a private, but her detective skills make her an useful asset should the higher ups ever notice these gifts of hers. 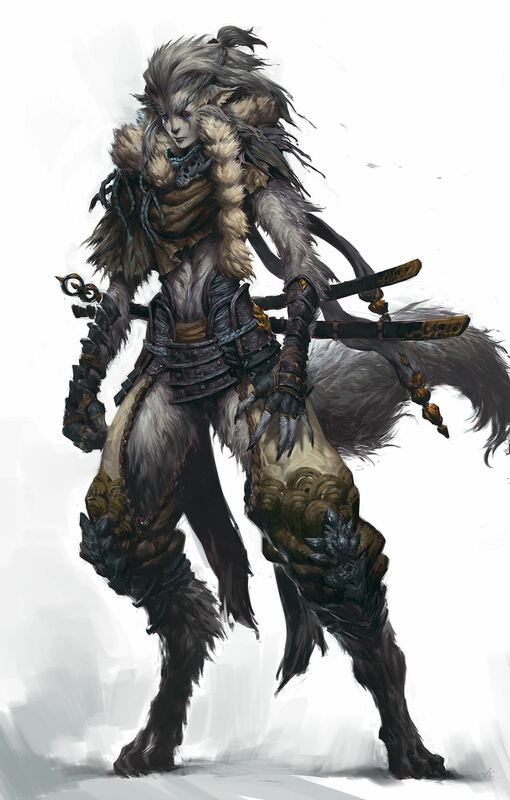 Because she's extremely used to being in her werewolf form, she's become very capable of using her werewolf form to human level of proficiency, noted by the fact that she can wield swords and wear armors on her body, as a human being would.